And so I’m back at Hotel Las Palmas in Matehuela, and it seems that nothing has changed in two years. Today was supposed to have been a driving day to cover the 300 + km with random stops along the way. The 57, D (toll road) in places is a fast road, averaging 100 km p.hr ‘Random’ means that I had selected three stops close-ish to Matehuela, where cacti that were new to Cliff and Ian had been reported from. 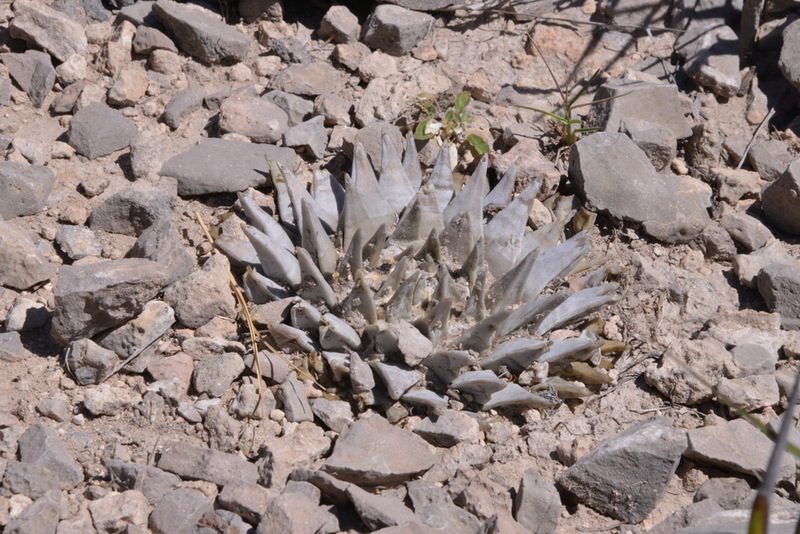 Driving along, we passed the Microondas (Microwave towers) at Nunez, – where Ariocarpus bravoanus ssp hintonii grows, but this is on the grounds of a cement factory and perhaps unsafe in the middle of day. But it also meant that Huizache Junction was near by – always good for a stomp around, both at the top of the hill (S3055) where this microwave station stands, with a second stop at the bottom (S3056), just as in 2011. When ever I have talked to people in the UK who have been here the question comes : ‘Did you see. X?’ Often the answer was no and even now, I photographed plants that I did not see in 2011 while some that I had hoped would be seen in better light, were not there. Spooky! Space ships rotating the plants at night? Anyway, the Ariocarpus retusus looked magnificent and healthy as though specially watered for our inspection but the Lophophora williamsii seemed to have been visited by a Shaman who had collected roughly half of the big clumps that we had seen here for his religious ceremonies, leaving the other half to recover for another year. Full plant lists added 5th May 2014. S3055 at the top, gave us: Agave lechuguilla, A. stricta and A. sp. 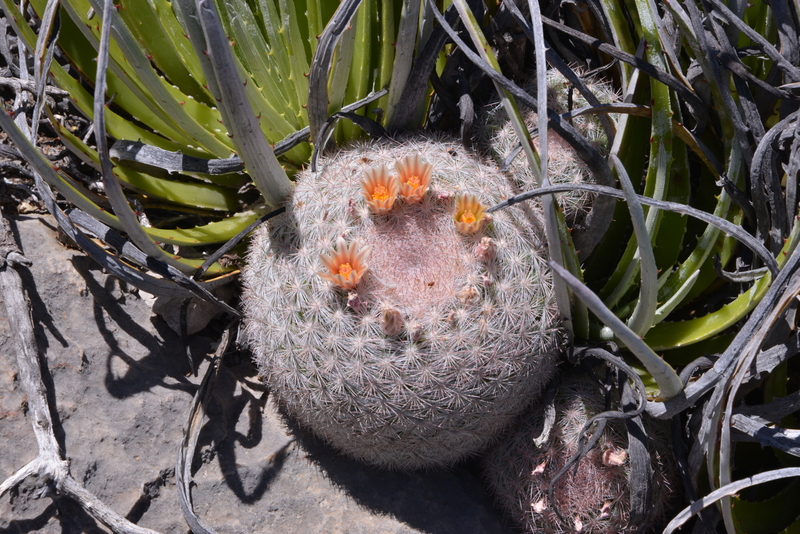 Ariocarpus retusus, Coryphantha sp, Cylindropuntia leptocaulis, Echinocactus horizonthalonius, E. platyacanthus, Echinocereus pectinatus, Ferocactus pilosus, Lophophora williamsii, Mammillaria sp. Mammilloydia candida, Neolloydia matehualensis, Opuntia microdasys, Opuntia sp, Sclerocactus (Ancistrocactus) uncinatus, Thelocactus bicolor and a Yucca sp. Not a bad crop for one stop, particularly when at the foot you can add Astrophytum myriostigma and Thelocactus hexaedrophorus (?) to the list. So we arrived safely at the hotel, with good wifi to get tonight’s message out and an excellent meal with Margaritas as a starter.On to our ‘randomly selected stops’. The information in the database is beginning to show its age. The exit off MEX57 for the turn to the first stop no longer existed, just green cultivated land. We turned up the next official road and found some interesting plants, but not those promised. The same thing happened for the next stop and we ended up on a road to El Mezquite where again we saw interesting plants but not the Turbinicarpus polaskii we had hoped to find. Today the temperature was only 32 C, instead of yesterday’s 37 C and I’m about to join the boys for a beer on the patio – time 20:34. Nothing from Ian in Mexico yesterday, but this is what Paul Klaassen posted on his blog.